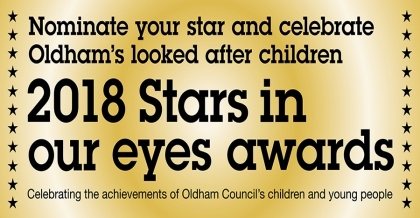 Nominations are now open to celebrate the achievements of Oldham’s looked after children. All the nominees will be recognised at the annual Stars in Our Eyes event in the Queen Elizabeth Hall on Friday 5 October. The evening is an opportunity to celebrate the events, progress and achievements of our looked after children and care leavers – a chance for them to get together with their families, friends and peers to make positive memories. There are 575 looked after children and 202 care leavers across Oldham who are cared for through foster carers, residential homes, supported living or within a secure environment. Every one of them deserves celebrating. This year the star categories are Sports and Leisure, Arts and Culture, Learning, Community, Health, Turnaround, Make a Difference and Environment. Accomplishments can be varied ranging from gaining qualifications to overcoming significant health issues, excelling in their hobbies or improving behaviour. Councillor Amanda Chadderton, Cabinet Member for Children’s Services said “This is an extremely important event in Oldham Council’s calendar. “Every child deserves to be celebrated and as corporate parents we take this very seriously.